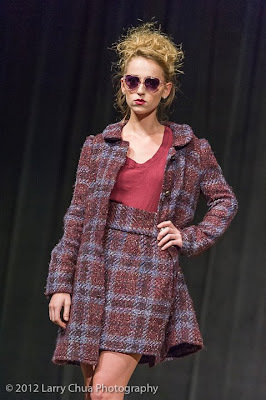 UWFW closed with a fabulous runway show on March 16th. Designers included Caroline Wilson, Rachel Frank and Libby Peterkort. Local boutiques such as Shoo, Pitaya and Jazzman shared their favorite spring wardrobes. Caroline Wilson debuted her mod-inspired line with a beautiful tailored suit, a Campbell soup can skirt, and button-embellished top. The edgy and fabulous Rachel Frank models strut down the runway wearing feathers, leather, chiffon and tulle. The line was fierce. 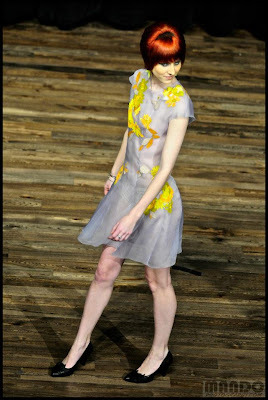 Libby Peterkort's collection was much softer, and models wore sheer embroidered dresses and tops. Her collection included a rad pair of leather shorts with lace and floral embellishments. As a model myself, I thought the show went extremely well. Not only was it fun, but the crowd was huge and lively. Models spent the day practicing and getting their hair and makeup done. The whole week, put on by MODA Magazine, was extremely successful. Kj Lynn organized and directed the wonderful fashion show. The week began with MODA's Night Out, where photographers and models mingled. Models, including myself, wore Rachel Frank Designs. Wednesday, MODA Magazine put on a Blogger Panel. Jessica Quirk, of What I Wore, came to speak. Many bloggers came to discuss their experience developing their own blogs and were happy to give advice to aspiring bloggers. UWFW was a great success and I am so glad I was a part of the event! I love this! We look so fierce in the photo from Monday.